Partially drain brake fluid from the master cylinder. Refer to BR-17, "Drain and Refill". Remove front wheels and tires using power tool. Refer to WT-47, "Removal and Installation". Note the position of components during removal to aid with installation. Do not deform brake pad retainers. Verify pad retainers are secured properly to torque member. Apply Molykote AS880N or equivalent to the mating faces (A) between the inner pad (1) and the inner shim (2), and install the inner shim and inner shim cover (3) to the inner pad. Apply Molykote AS880N or silicone-based grease to the mating faces (A) between the outer shim (1) and the outer shim cover (2), and install the outer shim and outer shim cover to the outer pad (3). Apply Molykote 7439 or equivalent to the mating faces (A) between the brake pads (1) and the pad retainers. Both inner and outer pads have a pad return system on the pad retainer. 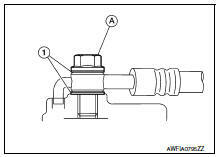 Install pad return lever (1) securely to pad retainer (2). Using a suitable tool, press piston into the brake caliper. Install cylinder body to torque member. Install the sliding pin bolts and tighten them to specified torque. Install front wheels and tires. Refer to WT-47, "Removal and Installation". Remove sliding pin bolts and the brake caliper. Do not drop brake pads or caliper. Check the front disc brakes for drag. If drag exists, refer to BR- 12, "BRAKE PAD : Inspection". Install the front wheels and tires. Refer to WT-47, "Removal and Installation".